Tai Ping Hou Kui is one of the Chinese Top Ten Famous Teas. It is one of the very few Chinese green tea which is made by grown tea leaves, instead of the very tender tea buds and leaves. It is produced in the Taiping County of Anhui. (In 1983, Taiping County was changed to the now name Huangshan District). The Tai Ping Hou Kui was invented in around 1900s. At that time the tea business in the neayby cities of Taiping County, eg. Shanghai, Nanjing and Yangzhou was very good. The customers demanded high quality green tea. The tea farmer Wang Kui Cheng 王魁成 (nicknamed Wang Lao Er)lived in Monkey Hill (Hou Gang 猴岗) of Taiping. He was very smart and experienced in processing of tea. 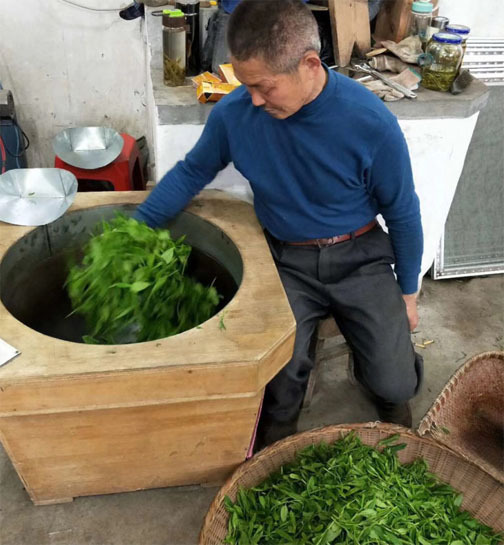 He decided to use high quality material and refined processing to produce a batch of premium green tea to meet the demand of his customers from big cities. 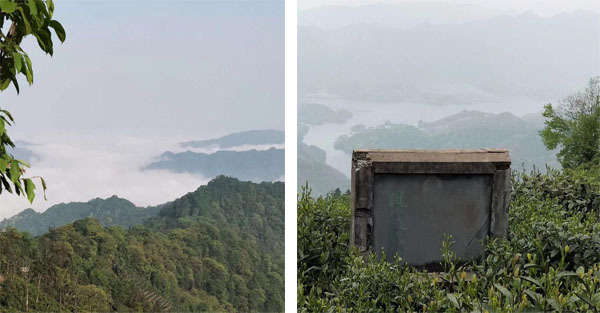 The highest tea garden in Monkey Hill is called as Phoenix Peak (Feng Huang Jian 凤凰尖) with altitude 750m, and he asked his men to pluck tender long shoot new open one bud three leaves from there. He used all his talent to process the tea. The tea was made and the quality was fantastic. His customers called this tea Wang Lao Er Kui Jian, which means the champion tip of Wang Lao Er (In Chinese, Kui 魁 means No.1, Champion. And also it happend the name of the inventor carried the word Kui 魁). Later, because the main places of this tea was produced from Monkey Hill (Hou Gang 猴岗) and Monkey Hole (Hou Keng 猴坑), and the inventor’s name got a character Kui. So the tea was formerly named as Tai Ping Hou Kui. (It was not because that the tea was plucked by monkey as the fairy story tells). In 1915, the Tai Ping Hou Kui attended the World Expo held in Panama. It was awarded as Gold Prize for its outstanding quality. 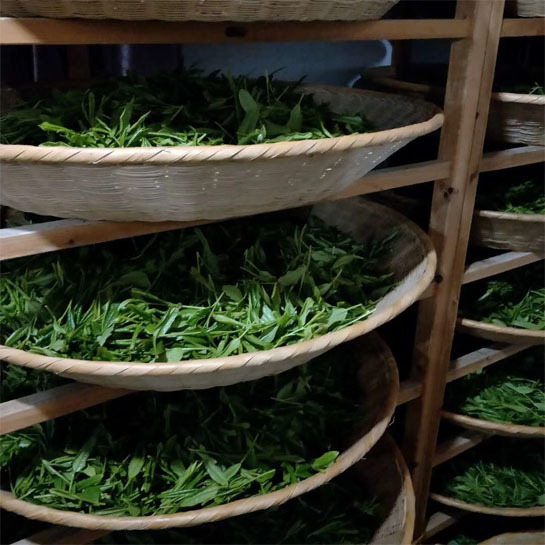 Though the Tai Ping Hou Kui had been famous in both China domestic and overseas, its output had remained very very low as compared to other famous Chinese teas. The record shows the annual output in those years. 2003 12600KG (In this year, the Tai Ping Hou Kui production had been extended to all the Taiping County, from the previous just Hou Gang and Hou Keng Village). Even to now, the Tai Ping Hou Kui output is still very less as one of the Top Ten Chinese Famous Teas. There are three factors which limits the production of this tea. 1, The tea material should be from the Shidacha cultivar. This tea cultivar is mainly planted in Taiping Area. And few of the other Chinese places plant this cultivar. 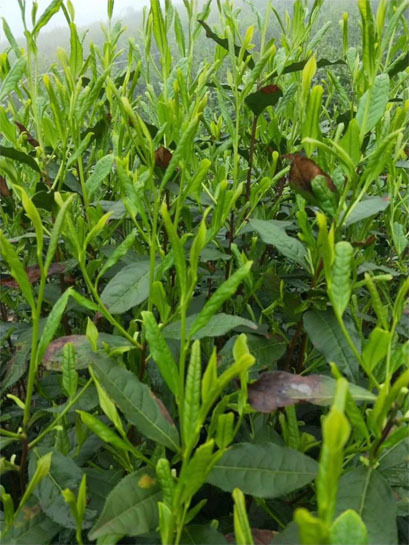 2, Only in the Taiping area, the tea can be tender enough to process the tea when the tea shoot grows to one bud three leaves. It means the tea shoot here can keep the tenderness, even it grows up. 3, Up to now, only the farmers in Taiping master the special way of processing Tai Ping Hou Kui well. Tai Ping Hou Kui is one of the very precious Chinese Teas. 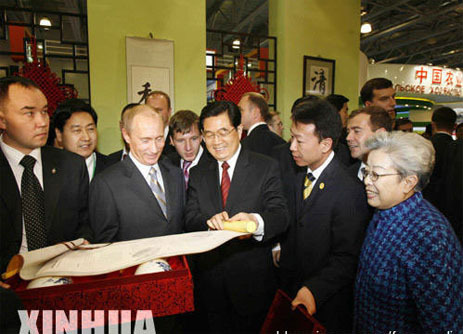 It is often presented by Chinese leaders as national gift to the presidents of foreign countries. 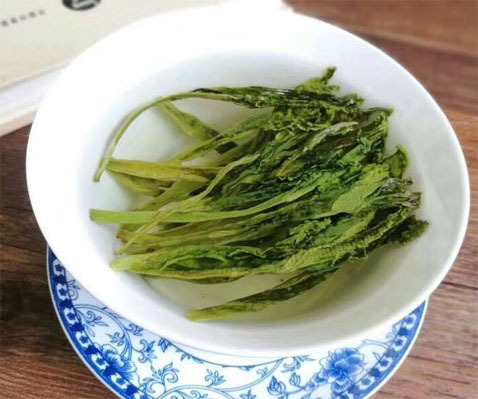 The Tai Ping Hou Kui uses the tender one bud three leaves from Shidacha to process. The hervesting time is generally after the middle of April. After the tea leaves are plucked, they would be hand sorted before processing. The tea leaves need be lay out for withering for some time. Slight water loss is necessary to make the Tai Ping Hou Kui higher fragrance and less astringency. The tea is fried (Shaqing, Killing) in the pan. The temperature in the pan is high which killes the enzymes in the tea leaves. After the tea is fried, they will be put on the wooden plate one by one. And then they will be manually and gentlely pressed by one mode covered by cotton cloth. 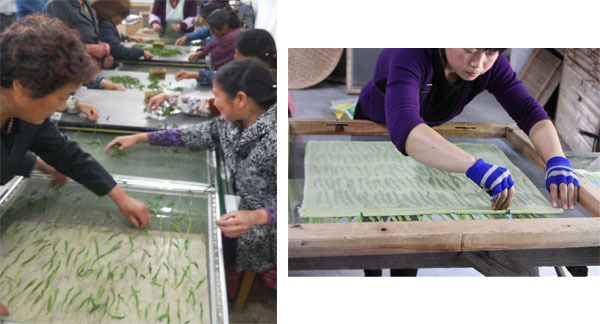 The pressing makes the flat straight tea body of Tai Ping Hou Kui. After the tea is pressed, it will be put into a wooden box for baking dry. Charcoal is burned in the bottom of the wooden box to offer the heat of baking. The tea is put on the wooden plates. There will be a few layers of plates. And the position of the plates will be adjusted in sequence to bake the tea evenly. 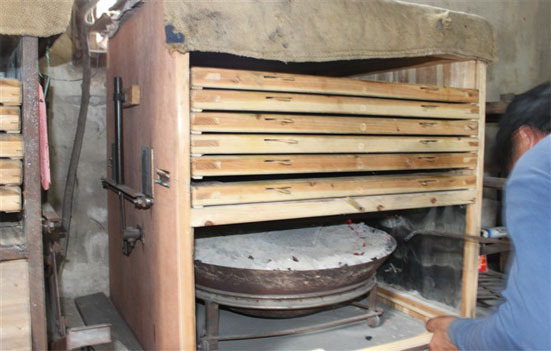 The baking is separated into three steps, Primary Baking (初烘), Second Baking (复烘) and Final Baking (老火). As the baking processing goes on, the temperature goes lower. And there is enough time interval in between the steps, to make sure the tea recover and advoid over heating. Meanwhile the water coontent in the tea leaves get time to re-distribute, so the baking can make the best quality of the tea. After the tea is finally dry, the tea needs to be packed into the container while it is still hot. 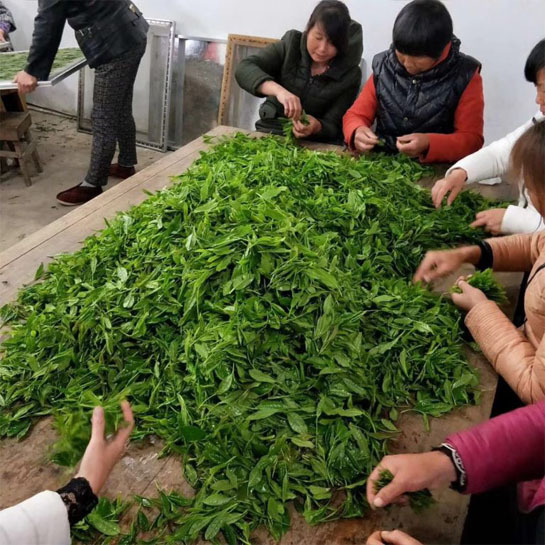 By the traditional Chinese way of packing, there would be lime put in the bottom of the container and a layer of Indicalamus Leaf (A kind of big broad bamboo leaf) is coated in the container. 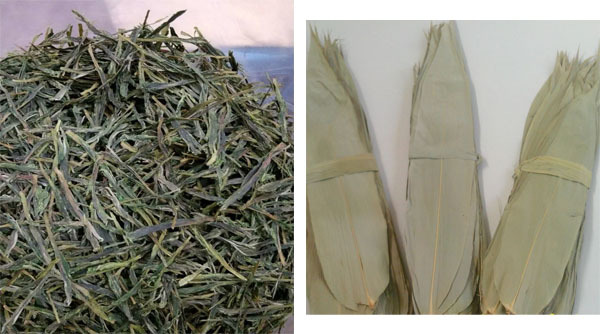 Indicalamus Leaf is a very good Chinese traditional packing. It is natural,clean and the smell is neutral modest and fragrant. It can help add the flavor of the tea. As Chinese saying, Tea is grass, Indicalamus Leaf is treasure. (Indicalamus Leaf is also the specified packing of the famous Chinese Rice Dumplings). How does Tai Ping Hou Kui Taste? It gives charming orchid flavor. The flavor is lingering. The taste is brisk mellow. And the aftertaste is very deep. What’s the difference of Genuine and Fake Tai Ping Hou Kui? 1, The tea body of Tai Ping Hou Kui should be thick, long and heavy. The color is dark green; while the tea body of fake one is very slim as flat paper, and short. And the color is yellowish green. Because the genuine Tai Ping Hou Kui tea plant can keep its shoot tenderness very well in the Spring. The tender shoots grow long and fat. While for the fake one, it can not keep its tenderness as it grows. So the fake material can not wait to grow too big to process. And also the save the cost, the fake Tai Ping Hou Kui is generally processed by machine, which press the tea leaves very tightly, and it looks very slim flat like paper. 2, The genuine Tai Ping Hou Kui flavor is strong and flower like orchid, the aftertadte is deep; while the fake one flavor might behave burning, smoky or smelly due to rough processing. and the aftertaste is pale due to inferior material source. 3, Generally there are cloth mark on the tea body of Tai Ping Hou Kui. While there is no such cloth mark on the fake Tai Ping Hou Kui. Because the later is pressed by machine without cotton cloth cover. Our company offer you the fine quality Tai Ping Hou kui from the most original source and meet EU-regulation. Welcome to inquire with us, write to: info@wufeng-tea.com.